In the land best own as an exotic desert, dotted with tropical oasis resorts, is a beautiful lake and a pine forest, over 5,000 feet above sea level. Laguna Hanson is a shallow, high meadow lake. 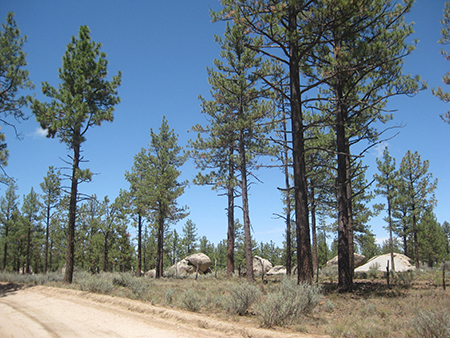 The beauty of this location surrounded by granite boulders and tall pine trees make a visit here well worth the effort. This shallow lake is named after an American rancher who arrived in the area in 1872 and lived there until 1880. The official name appears on some maps as Laguna Juárez, but everyone knows it by the name of the rancher from so long ago. 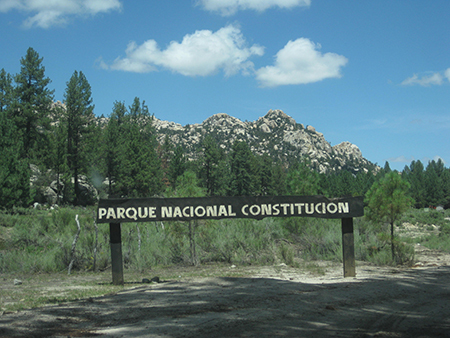 The Sierra Juárez forest around Laguna Hanson is inside a National Park, named Constitución de 1857. The park was created in 1962 to help preserve the scenic mountain region and offer recreation. During Easter Week (Semana Santa) the park becomes very busy as many city dwellers escape their urban habitation for the high mountain park of Baja. A small day-use fee may be collected (64 pesos/ under 4 dollars). Food and cabin rentals are available at Laguna Hanson and nearby Aserradero. The road to Laguna Hanson from both from Highway 3 (20 miles) and Highway 2 (38 miles) is very good for trucks or SUVs. Four-wheel drive should not be needed unless rain or snow is heavy. Passenger cars could make it in dry weather but only if the driver is skilled on unpaved roads. After any rain, there will be many big puddles to go through. The road continues north passing Laguna Hanson through the pine trees. After 20 miles, a region of abandoned gold mines is passed before the road begins to drop in elevation and come to the edge of La Rumorosa, a large town on Highway 2, elevation 4,200 feet. This is a highly scenic drive and quite a departure from the typical scenery one is accustomed to in Baja California. Mile 0.0 Highway 3 at Km. 54.5, east of Ensenada. Mile 5.2 Fork left. Elev. 4,000'. Mile 11.2 Pine trees begin. Elev. 5,000’. Mile 13.7 Rancho El Rayo. Mile 15.1 Road southeast to Rancho La Botella. Cattle Guard crossing. Mile 16.2 Aserradero an abandoned saw mill town with some tourist services. Food. Mile 17.5 Cabins, market, food. 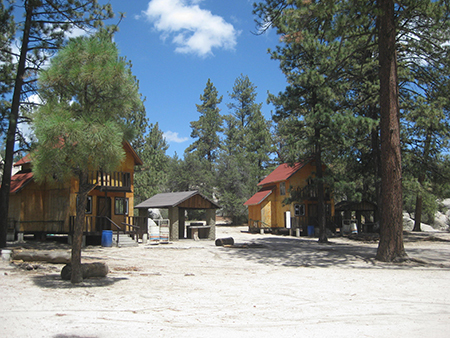 Mile 19.8 Laguna Hanson: park headquarters, cabins, daily use fee 64 pesos. Elev. 5,300’. Road heads north passing by the lake which is shallow and often empty. Mile 22.1 Road east to Rancho San Luis. Mile 24.6 Rodeo del Rey, an abandoned hotel. Mile 25.0 Road west to Rancho Bajío Largo. Mile 35.6 Road west to Rancho El Topo. Mile 40.4 Former mining area of La Milla. Mile 42.7 Road junction southwest from Las Margaritas. Mile 45.6 Rancho Ponderosa road east. Tourist services offered. Mile 48.7 Rancho Nuevo road east. Mile 55.1 Blacktop paved road. Mile 55.4 Parques Los Potrillos and El Tesoro campgrounds. Mile 57.5 Highway #2 (Km. 72), La Rumorosa. Mexicali is east and Tecate is west. The toll highway, Mexico 2-D can be accessed by turned west for a short distance on Highway #2. David Kier is a veteran Baja traveler, author of 'Baja California - Land Of Missions' and co-author of 'The Old Missions of Baja and Alta California 1697-1834'. Visit the Old Missions website. Thank you for supporting the Surfrider Foundation. I will tell all of my friends about your great service and I am now a life-long customer. Thanks.